The division two derby match was a titanic battle – a joint(?) report from both team captains. Alex and Richard fought out a Sicilian and agreed a fairly early draw. Chris got nothing as white out of a Catalan Opening (“… need better opening preparation – story of my chess life!”) and was forced to go into a QRR v QRR middlegame with black having the advantage of a Qside majority. Gerry declined an opportunity to go into a probably advantageous Rook ending and Chris managed to hold the draw. Callum built up a strong attack against Peter and always appeared (at least!) to be in control. Ben pushed a phalanx of pawns into Mac’s position but met strong resistance. When Ben failed to capitalise on his space advantage, Mac unravelled his position to win well. At two points each, all eyes then turned to board two – John had got the worst of the opening against Peter, but fought through to a K+4P each ending (“Peter amazed me by swapping queens into a seemingly lost K&P ending but our resident expert, the correspondence GM Joe ‘Stockfish’ Valerio, declared the game a draw from the word go!” – Chris) whereupon he turned down Peter’s draw offer. The outcome of the game (and the match) then seemed to swing from side to side before finally ending in a draw, to halve the match. “With just under a minute left Peter was K+Q vs K+P+P and accepted a draw offer, causing shouts of derision from the spectators…. it’s fair to say that the D team were more pleased with the result than the C team!” – John. The A team were comfortable winners in the derby match. Steve Ledger won efficiently, an exchange sacrifice obliterating Pike’s position. This gives Mr Ledger 8/8 in the league which is outstanding by any standard. Ravi never looked in trouble against Joe who suffered on the clock after a late arrival. Alex and Paul fought out a hard draw. Nick’s welcome return to league chess was spoilt by finding Neil in good form – the only winner for the B team. Chris capped his first game for the A team this season with a rather amusing smothered mate (with a Bishop!). This result leaves the A team out in front of division 1. Leighton Buzzard and MK with matches in hand have dropped fewer points but still have to play each other twice. Richard achieved a fine draw with black against Andrew Perkins. Callum scored the best win of his chess career against Michael Joseph, again with black. Gerry drew against Pete Montgomery, fending off what looked like strong pressure the one time I glanced at his game. Mark left his king looking a bit lonely against John Kelly and suffered the consequences. I (John H) won a piece on move 10 in a King’s Gambit – then it all went wrong. A series of backwards moves put me under pressure, then I spotted a line that led to mate on f7. At the end of this I picked up the f7 pawn, and realised that my rook on h8 was not going to defend my queen. Qxf7+? ?, Kxf7, white resigns. The second round took place (mostly) at the Kents Luton Club (Bedford players bolded below). Chris Hill reports on a busy night! I was present at a remarkable evening at the North End Working Men’s Club last night. The chess was hard-fought but lacking in great quality and certainly in brilliancy but that didn’t matter. The chess club was more alive than on possibly any night I can remember, and certainly on any night since we left St Marks. We have only 22 members in the club but 18 of them were present last night, 10 playing in the A and C Team matches, 4 playing in Division 2 of the Club championship and another 4 drinking, chatting and pointing out the various errors made by the 14 actually playing! Certainly this was the sort of scene that North End envisaged when they offered us the room for £10 per night – plenty of imbibing and cash handed over the bar rather than a few geeks shut away, invisible to the usual members downstairs. But a happy medium should be struck – surely 4 or 5 pints during a game cannot increase playing strength (no names!) and captains should encourage a more conservative approach! The noise levels were perfect – did someone pull the plug on the jukebox!? In terms of the chess, I cannot say much as, having obtained an excellent position against Andrew Perkins after 15-20 moves, I was keen not to let the tiger escape. But it is one thing to get a strong position against such an experienced and technically sound opponent, quite another to turn that into a winning position and after a long period of sparring he offered a draw which was gratefully received. The rest of the team battled hard into the endgame but against higher-graded opponents a single additional draw, achieved by Mac, was all we had to show for our efforts. The A Team match showed how easily the likes of Milton Keynes B (and indeed our own B Team) can make life very difficult for the top teams. We could easily have lost on Boards 3 & 4 which would have ended our title hopes for the season but Paul (see game) and Mike gained a vital draw and win respectively and, with a point from the ever reliable Steve Ledger, 2 match points were obtained and the pressure on Leighton Buzzard A maintained. Strangely the two club games continued long after the matches had ended – John and Callum (master and pupil a la Star Wars) fought out a draw where neither seemed to want to accept the half point – with the pupil getting closer and closer to becoming the master. Joe finally wore down Sajan to claim a win. So the evening was enjoyed by most if not all. I visited one of the few absent members this morning. Nigel is looking a lot better and looks forward to playing in the re-scheduled C Team fixture against MK C in April though we may not see him at the club for a while yet. In order of completion, we lost first on board 3 when Callum failed to turn up having apparently confused the words “Tuesday” and “Thursday”. I (John) had another black against Brian Valentine and got nowhere fast. 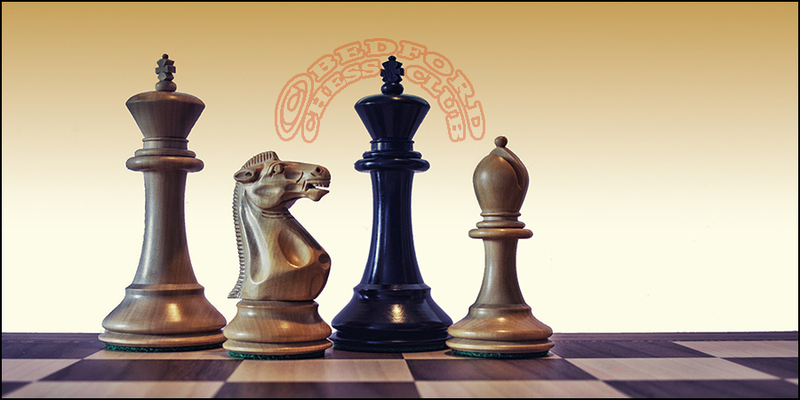 Ben, in an Evans Gambit, pointed his rooks, bishops and queen at the black king and impressively sledge-hammered his way through. Mark, playing the black side of a Kings Indian, reached the point where it looked like all of his pieces were going to be pushed off the board into his lap. A feisty sacrifice gave him some fun. but it was never quite going to work. Richard got the worst of the opening and dropped a pawn. He finally equalised (as white!) at about move 30, at which point they agreed a draw. Hard fought but always difficult with little reward for the top two boards (although board 1 might have been less reckless). Alex steadied the ship, John always had chances against the mercurial Hunt and Neil (see Games) avenged his loss earlier in the season with an efficient win. In a rather chastening yet enjoyable event, Bedford struggled to score 1.5/8 against Linton and Broadland – Steve Pike, Nick Collacott, Michael Botteley and Mac Mackenzie formed the gallant (?) team.